Polkadot Nail Polish Strips in funky polkadots! 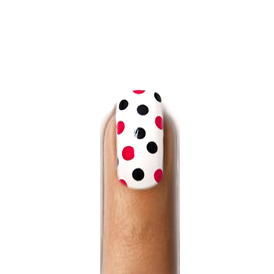 For the bold and confident to make a fashion statement rocking polkadot nails! Coveted Cosmetics nail polish strips take minutes to apply and lasts for up to 14 days if you take proper care of them. Comes in a package of 20 strips in total, enough to do your fingers and toes! Complete with nail file and cuticle stick. To apply, stick them on your nails, adjust position as needed, file off excess and voila its done! No more toxic fumes to inhale and no more waiting on nail polish to dry! Our nail strips are made with real nail polish and can be removed with nail polish remover.